Shred Connect is Garden Grove’s go-to shredding company for all your paper shredding services. We’ve been steadily growing since 2008 and consistently strive to do whatever it takes to be your premier and secure document shredding company now and in years to come. Our philosophy dictates that we provide superior shredding services to the customer at an affordable price. Additionally, it’s just as important to help the under-served by not imposing unnecessary fees or to tack on hidden charges that can add significant cost to their already-burdened wallets. This approach has been the catalyst for how our shredding company does business in the community—we provide paper shredding services that maximize everyone’s time and efficiency while ensuring secure document destruction. Superior customer service never goes out of style with a discerning public. From our original shredding company base in Irvine to our twelve present-day Orange County locations, Shred Connect’s been able to consistently increase its visibility and productivity for the Garden Grove area while maintaining minimal expenditures in order to consistently provide you outstanding document destruction services at an affordable price. Shredding Containers Make Storage Easy! Shred Connect provides free containers that can hold up to as much as eighty pounds of materials for security shredding. Each container comes equipped with a security lock for personal and professional peace of mind. Store as much or as little as you need destroyed our shredding company charges you only what you instruct us to eliminate. After two additional appointments with us, you’ll be eligible to receive a personal desk container that will be serviced by us free of charge. That’s even more savings in your pocket! Our Garden Grove locale is one of twelve drop-off destinations for our busy clientele throughout Orange County. Our customers find that bringing only what they want to pay to have destroyed is not only highly economical but psychologically liberating, too. Many of them are simply relieved to have their clutter taken off their hands. As a confidential shredding company Shred Connect knows how vital it is to ensure personal and professional safety and security. That’s why we shred your personal documents and other material while you watch or provide you with a Certificate of Destruction. Doing this provides our customers the additional reassurance that no records can ever materialize that could compromise their integrity. When all necessary paper shredding and secure document shredding have been completed to your satisfaction, Shred Connect provides you an official Certificate of Destruction for your efforts. 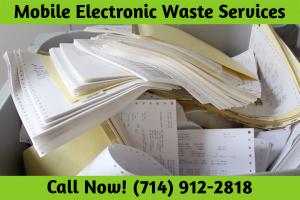 In fact, we encourage anyone, whether you’re dropping materials off or arranging for us to make a mobile shredding house call, to closely watch and observe the step-by-step process that explains, in detail, what we do to ensure complete annihilation of any and all records. As with any business venture, open communication is paramount for the former to succeed. You are encouraged to always make an advance appointment in order to allow our shredding company sufficient time to tend to all other clients’ specific paper shredding needs. Contact Shred Connect shredding company today for all of your paper shredding needs!